Declan Donnelly will present Saturday Night Takeaway on his own for the rest of this series, ITV has confirmed. This Saturday’s show was cancelled after Ant McPartlin was arrested on suspicion of drink driving on Sunday. The following two episodes, which will air on 31 March and 7 April, will now be presented solo by Donnelly. Mike Large, ITV’s director of communications, also confirmed the finale of the series would take place as planned in Orlando, Florida. According to The Sun, Scarlett Moffatt and Stephen Mulhern will continue in their supporting roles on the show. Dan Wootton, the paper’s showbusiness reporter, also claims McPartlin will not co-host Britain’s Got Talent when it returns to ITV later this year. It is likely this would only apply to the series’ live shows, as the audition programmes have already been recorded. “Whilst I never thought I’d be in this position, after much discussion and careful consideration we’ve decided that the remaining two shows of this series of Saturday Night Takeaway will go ahead,” Dec wrote on Twitter. “We made a promise to take hundreds of deserving winners to Florida to watch the series finale, and we will honour that. Where next for Ant and Dec? McPartlin was arrested in south-west London on Sunday after a collision involving three vehicles. Police said a 42-year-old man was arrested at the scene after failing a roadside breathalyser test. Ant’s publicist subsequently confirmed he would be taking time off “for the foreseeable future” and would have further treatment. 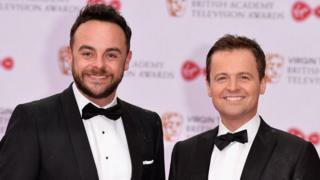 Neither Ant nor Dec attended the Royal Television Society Awards in London on Tuesday, where they were in contention for two awards.